Ok, so everyone is busy surfing through the internet and are visiting tons of sites. This tip could well change the way you search in internet completely. I don’t know why Firefox didn’t pay attention to this unique feature and attract more people to them. Everyone loves searching, and google is their pet. But it’s not just Google that you try searching – Wikipedia, ebay, Yahoo, you name it… virtually, every site has this option to search. So why should we waste our time by going to all these places and search content there? Why don’t we just do this directly from the address bar without even opening the site?? Lets see how it’s done from Firefox. 1. Open Google and right-click the search bar. 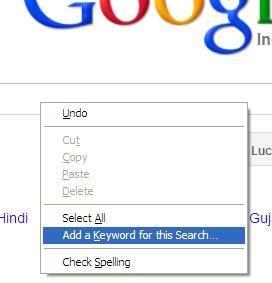 Choose the option ‘Add a Keyword for this search‘. 2. You will get a small dialog box. Enter the name of the bookmark in the Name field. Then in the keyword field, type a keyword you would like to use. I chose to use the keyword ‘go’. 3. Ok, close Google and open a fresh tab. In the address bar, type ‘your-keyword‘ <space> ‘search-term‘. For example, I am typing as ‘go india'(without quotes), as my keyword is ‘go’ and my search term is India. 4. The result will take you directly to the Google search result for ‘India’. 5. Surprised?? Ok, now try the same on Wikipedia, from step 1 to 3. Once this is done, you can directly bypass to the search result of your desired website. This entry was posted in PC & Tech Tips and tagged firefox secret search tip Add a Keyword for this search, Hidden search trick for Firefox, Keyword search trick for Firefox by vimalsuresh. Bookmark the permalink.